If you follow investing much, you may have heard some talk recently about the US stock market reaching all-time highs. This is true; as I write this the Dow Jones Industrial Average recently crossed the 20,000 mark for the first time ever, along with new high marks for the S&P 500, the NASDAQ, and various other US stock indices that measure market performance. This seems like a good thing, and probably is for those of you invested in US stocks who have seen some nice growth lately. However, along with these record highs comes plenty of doubt and fear. Are stocks too expensive? Are we due for a correction or market decline? Should I get out while the getting’s good? The truth is (and you will hear us say this often), no one knows exactly where the stock market is headed. What we can do is try to learn a little bit more about all-time stock market highs in order to make educated decisions instead of knee-jerk reactions. A January 2017 study from Dimensional Fund Advisors (DFA) investigated monthly data from the S&P 500 going back 90 years. They looked at months where the index closed at an all-time high, and the performance for the following 12 months after that high. They also compared this to all 12-month periods in that entire 90 year data set. 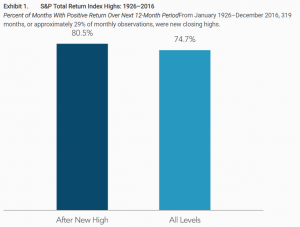 DFA found that when the S&P 500 reached an all-time high, the following 12-month period showed a positive return 80.5% of the time. Generally speaking, cashing out of the market after an all-time high in anticipation of a drop off would have been a bad decision 80.5% of the time. What’s more, all 12-month periods in this study showed positive return 74.7% of the time. You are actually a bit less likely to find positive returns for a random 12-month period than you are for a 12-month period following an all-time high. There is no evidence that an all-time high is an indicator of negative returns in the near future. One more interesting fact from the DFA study: almost 30% of all months during those 90 years closed at all-time highs. That’s a lot of records broken! However, when looking at a visual representation of the stock market, this makes sense. In the graph below, you can see the performance of two parts of the market: large stocks and small stocks (shown here compared to bonds, treasury bills, and inflation). Despite short-term fluctuations, the stock market has steadily moved upward over the long term, meaning as it keeps increasing it will keep setting new highs. As you can see, getting out of the stock market just because it reaches never-before-seen levels hasn’t been a great decision historically. Plus, with the market is consistently hitting new highs, that would mean a lot of buying and selling and worrying. So what can we do to become comfortable even when the market reaches new heights? By having a solid investment plan that you trust, and periodically rebalancing the investments within it. Each of our clients has a “target allocation” that guides how investments are managed. These targets are based on the client’s risk tolerance, current needs, future goals, historical investment data, and more. For simplicity’s sake, let’s use an example in which a client has a target allocation of 50% stocks and 50% bonds. When certain types of investments grow more than others, such as stocks have recently, they become a bigger and bigger part of the allocation. What started as a portfolio of 50% stocks may soon become 55% stocks, and then 60% stocks, and so on. While it is nice to see things grow, this also means the client gets farther and farther away from their original target. This can lead to unnecessary risks and an investment mix that isn’t aligned with a client’s overall goals. This is where rebalancing comes in. We set “tolerance bands” around each investment category. The previous example might use a 10% tolerance band for stocks and bonds. This means we don’t want anything to be more than 10% above or below the target. We have software in place that tracks these percentages and automatically alerts us when this happens, at which time we will look to move investments back to that original target. This accomplishes a few things. We are systematically doing what many people get concerned about: lowering levels of certain investments after they increase dramatically (or vice-versa). The basis of the decision, however, is not the market movement itself; it is your overall financial plan that directs what the investment mix should be. This allows us to make decisions in an organized fashion rather than making knee-jerk reactions to the market. Your original plan was developed to suit your goals and needs; rebalancing ensures it continues to do so. If you’ve considered all these things and still feel uncomfortable with your investment situation, perhaps it is time to consult with your financial planner. While new market highs alone might not be reason enough to sell stocks, any changes in your risk tolerance or goals could be.